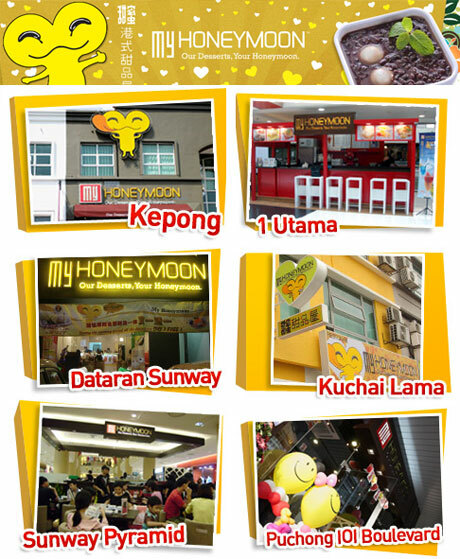 Share Your Love at Honeymoon Dessert House! Thinking of bringing your family for dessert after a sumptuous meal? Looking for a place to relax and unwind with your friends after a hectic day of shopping? Searching for the ideal venue to spend endless romantic hours with the love of your life? With over 250 choices of delectable desserts you can now experience hundreds of different types of desserts to eat with your love ones! From an incredible selection of traditional hot, cold and chilled delights ranging from sweet ball, soy bean curd and sago to fruit grass jelly, icy swallow and chestnut soup; all of which look good, and taste great! You must try the popular Durian Pancake and Summer drinks! Get your 50% off RM10 Cash Voucher at My HoneyMoon Dessert here! The benefits from natural ingredients used; mango, for instance, promotes good digestion, prevents nausea and retrieves fever, while pamelo is known to lower blood glucose and reduce phlegm production. Almonds nourish the lungs, alleviate coughing, soothe the intestines and promote healthy skin; black sesame and alleviating wind; purple rice provides nutrition for the blood; and walnuts stimulate the brain. So who says desserts are bad for you? Outlet: Kepong, Sunway Pyramid, Puchong, Kota Damansara, One Utama, and Kuchai Lama *new opening*. 50% off RM10 Cash Voucher at My HoneyMoon Dessert.